As a nationally accredited program, the School of Communications monitors four indicators of student success: enrollment, retention, graduation and employment. The School of Communications is home to about 20 percent of Elon’s student body. The school offers six undergraduate majors: Journalism, Strategic Communications, Cinema & Television Arts, Communication Design, Media Analytics, and Sport Management. Retention refers to the number of students who return to school the following year. One method of determining retention in a major is based on the entering first-year class. Another method is based on the last declared major of all students at the university. This section provides data for both methods of calculation. The Accrediting Council on Education in Journalism and Mass Communications specifies that retention, graduation and employment data be provided for the accredited Communications program. When students are admitted to Elon, they are free to enter the major of their choice, unlike some journalism and communications programs that have their own admission process or restrict students from declaring a major until the junior year. As a result, high school students who express an interest in Communications in their application process to Elon become the entering first-year cohort in Communications. The chart below shows that 203 students expressed an interest in Communications when they applied and were admitted to Elon in Fall 2013. 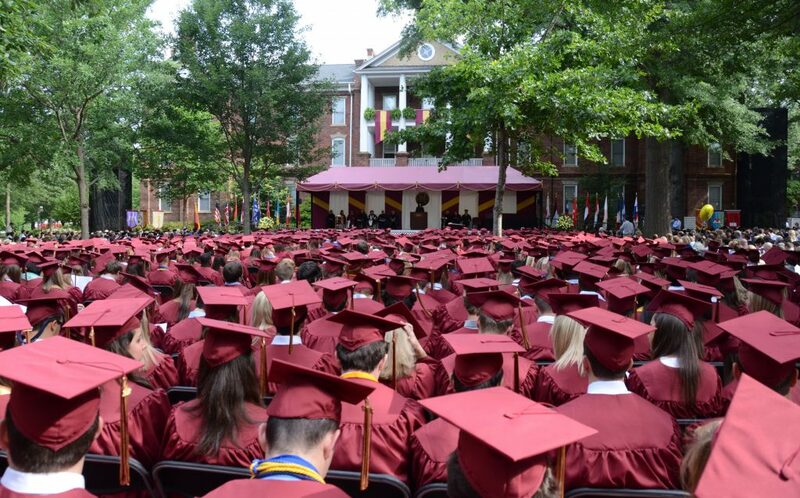 Three years later, 178 of them (88%) had become seniors at Elon, with 132 (65%) as Communications majors. This means 46 seniors remained at Elon but had switched to other majors since their first year. 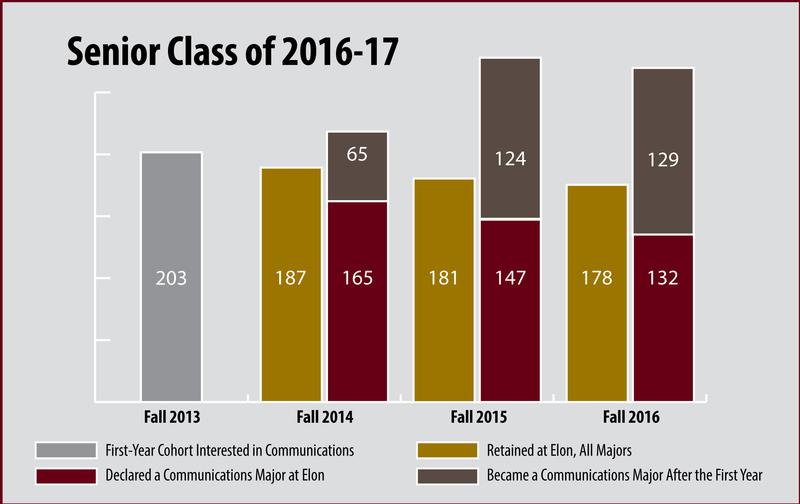 Meanwhile, an additional 129 students from that first-year class became Communications majors after they began at Elon, resulting in 58 more students being Communications majors in the senior year (261) than in the entering first-year cohort. These tables reflect full-time first-year students entering Elon. They do not include transfer students and count a student (for instance, those who double major) only once. The technical description is “unduplicated, first-time, full-time and first-year students enrolling at the university.” These tables and later ones do not include Sport Management, which is a separate department in the school and not part of the accreditation process. A second method of determining retention in a major is based on the last declared major of all students at the university – both those who eventually graduate from Elon as well as those who leave the university with Communications as their last declared major. The chart below shows Communications was the last declared major for 288 students in the Class of 2017. 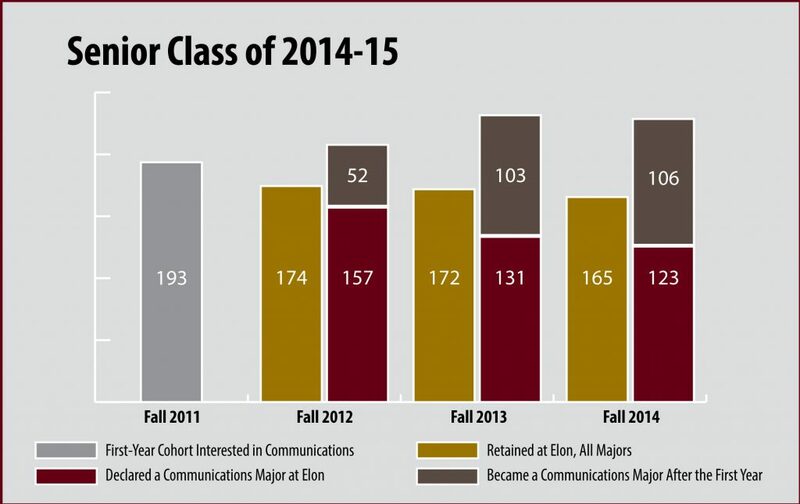 Some entered Elon as first-year students in Fall 2013 having expressed an interest in Communications, some became Communications majors after starting at Elon, and others were Communications majors when they left the university. 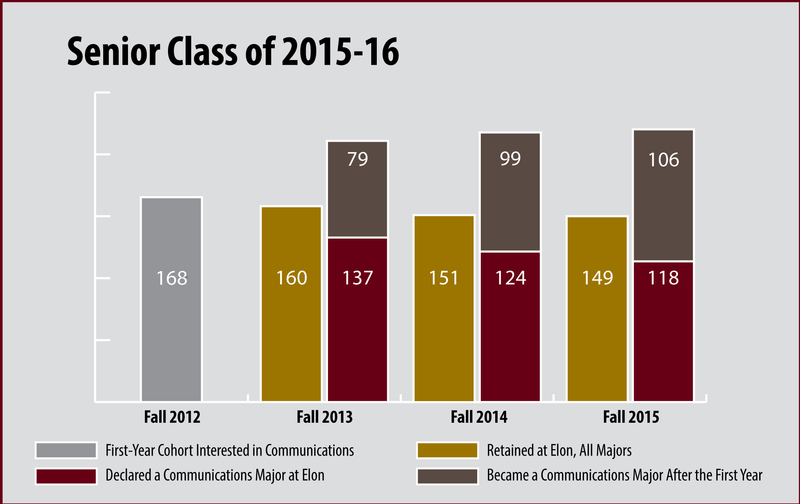 Of this last-declared-major cohort, 269 (93%) returned to Elon the following year, 262 (91%) remained Communications majors by their junior year, and 261 (90%) remained Communications majors in their senior year. University retention rates reflect full-time, first-year students in all majors who remain at Elon at the time of fall enrollment each year. Because students may change majors at any time, retention data for Communications majors are based on their declared major at the time of fall enrollment each year. A four-year graduation is the norm for Communications students at Elon. In the graduating Class of 2017, 249 students graduated as Communications majors in four years. This is 86% of all Elon students whose last declared major was Communications. Each year, a few more students in the cohort graduate in five years. Each year the university conducts a survey of the most recent graduating class, nine months following graduation, to ascertain employment or graduate school status, type of employer, and salary. The report on the Class of 2017 was released by the Student Professional Development Center in spring 2018. A few graduates each year indicate they fit in both categories. Communications graduates who are employed are asked each year to indicate the type of organization where they work. 2017 percentages were based on 222 employed graduates who reported their organization type; 2016 percentages were based on 149 responses; 2015 percentages were based on 178 responses. In 2017, 92% of the employed Communications graduates who responded to this survey said their work was related to their career goals. 2017 Communications graduates reported an average starting salary of $39,157. Salaries were reported by 118 employed Communications graduates who responded to this survey question.